I hopped on board the Charcutepalooza wagon after my friend Cathy (the very industrious Mrs. Wheelbarrow) mentioned that I didn’t have to participate every month. Not that I’m not game for trying new things, but I’m temporarily living with my future mother-in-law until we find a house to buy here in Austin. Hanging a duck somewhere in her house is just not going to fly. Imagine my excitement to discover that February’s challenge was on my list of things to try sometime. I’m keen on salt curing and it’s now a practice I use every year come wintertime when the Meyer lemons are in season. Preserved Meyers are just salt, lemons and some of the lemons’ juice. Extending my curing skills to meats has been in the hopper for a while now. I know that The Ruhls state you have to use Ruhlman’s Charcuterie book, but I can’t afford to add it to my library right now (and surprise, surprise, there’s a hold on it at the library already). Eugenia Bone has a cured bacon recipe posted in her Well-Preserved book that’s based on Ruhlman’s recipe, so I used that. I’m not going to repost the recipe here, since that’s an important premise of Charcutepalooza and also my personal belief to honor the creators of recipes by borrowing their books, checking them out from the library, or buying them when we can manage to do so. I will discuss the timeline and what I learned from this experience. This was so much easier than I’d ever imagined. Curing is the perfect activity for busy people because salt does all the work without much involvement on your part; you just have a few tasks spread out over the course of a week or so. 1. Obtain a couple pounds of local, sustainably-raised pork belly. After a bit of price research, I got the best deal by placing an email order with Richardson Farms and picking it up from them at the farmers’ market; local, pastured meat for $7 per pound, yes please! 2. 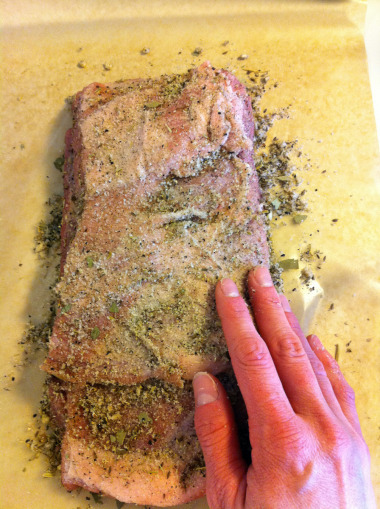 Day 1: Prepare salt/spice rub and coat pork belly well. Place in fridge and go about life as usual. 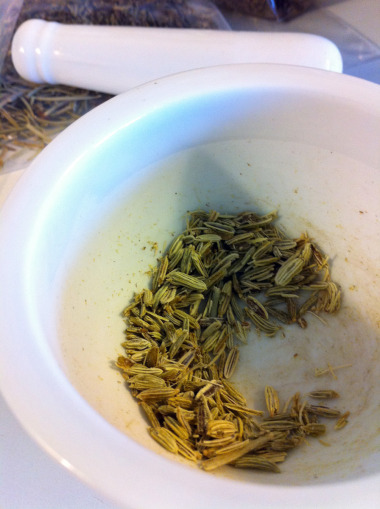 I don’t own a spice grinder, so mortar and pestle it had to be. A good arm workout! 3. 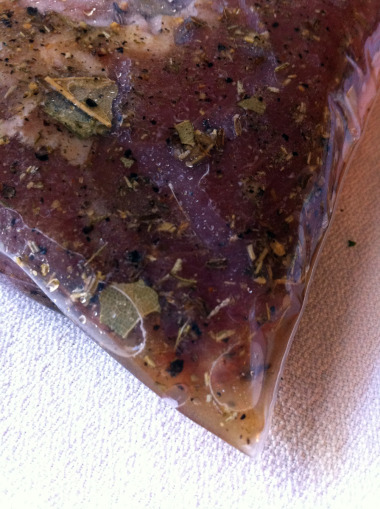 Day 7: Wash off spice rub, place meat in fridge overnight to express any excess moisture from the cure. 4. Day 8: Slow roast the meat in the oven until it reaches 150 degrees F, which will take between one and two hours. Slice and store your bacon in the fridge for up to two weeks. 5. 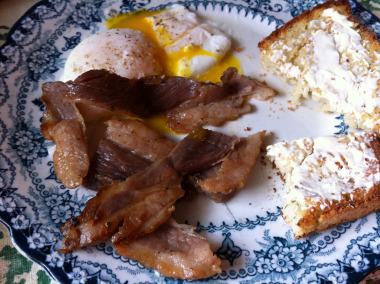 Cook up portions of your home-cured bacon for breakfasts and special brunches and feel proud of yourself.